Glendoe power station first opened in 2008 and represents Scotland’s first large hydro development since the 1960s. A rock fall closed the station after just a few months. Reopened in 2012, today Glendoe power station is one of the largest in Britain. The underground station is fed by an 8km pipeline from Glendoe Reservoir and discharges into Loch Ness. The water drops 609m to the turbines – the greatest head of any hydro scheme in the UK. This makes Glendoe the country’s most efficient hydro station. It can reach full output in just 90 seconds, helping to meet sudden changes in demand for power. 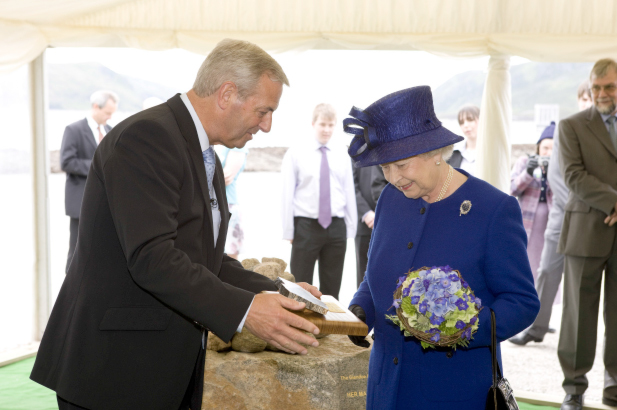 HM Queen Elizabeth II opened Glendoe power station on 29 June 2009. She’s shown here with SSE Chairman Lord Smith of Kelvin.